making the name of Harima known to the whole of Japan through its power as a major Company. King Jozo is well known for its Hinode Mirin. Our company was founded in 1900 as a brewer of Mirin and Shouchu. During the Edo period, Mirin was used in regular households, but at the time it was still considered a high class item with its sweet taste produced by sticky rice. Fortunately, we are now the leading company in the business as a producer of Mirin type seasonings and cooking sake. We think about the development of the entire industry and with that in mind have expanded our business overseas to the United States, China, Singapore, Malaysia and Thailand. 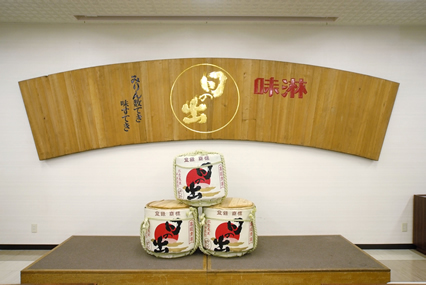 In 1993, our company embarked on producing its first Seishu (refined sake). 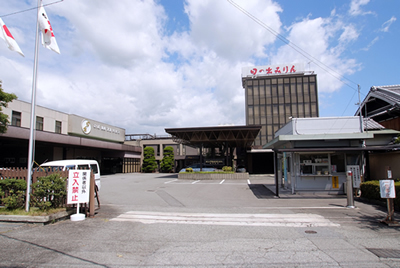 Currently there are two factories in operation, which produce sake in Harima all year round. Was starting a new business as a producer of Seishu a challenge? We were in the brewing business to begin with as a producer of Mirin, so we always wished to someday make Nihonshu (sake), which is a national drink. Producing Nihonshu is basically an industry steeped in tradition and in that tradition is the world of Touji (the head of a brewery) and brewers. One word by the Touji changes everything. In a sense it is a different world compared to that of a regular company. We have applied ourselves to the task and became part of the Tajima Touji Association. After about three years, it started to feel like things were on a good trajectory. Looking back, it was at a time when sake was being consumed less, so it was a challenge. However, it shows that the direction we were going in was not wrong. There were also outlets to supermarkets etc. that were established through our Mirin sales, so that was very helpful. 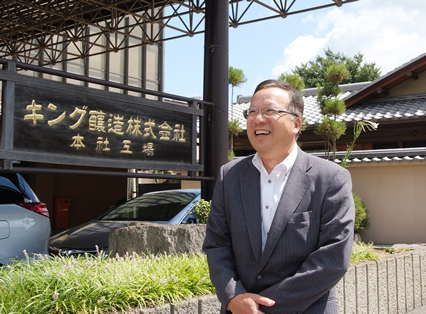 In 2008, a new factory was completed and from 2012 on we adopted an employee Touji system. Now there are two fully operational factories, producing sake throughout the year, which is referred to as all seasons in the industry. Tell us about the characteristics of the products. "Hinode Mirin"and sake are main items of the King Brewery. There are many types of products, there are dozens of types of Seishu alone, but among them Banshu Nishiki stands out, as it bares the name of the locale. Our company mass produces sake, so there are many products sold in paper packages or small cups. We make decisions on taste based on the needs of the consumers, but generally we make products with a simple taste that is delicious whether it is prepared cold or hot. In regards to Seishu brewing, we do not have the history of famous breweries, but instead, have the attitude of trying something new. We do not feel tied to the past. It has not been tried yet, but producing low alcohol drinks sounds interesting, too. Tell us about the company's future goals. 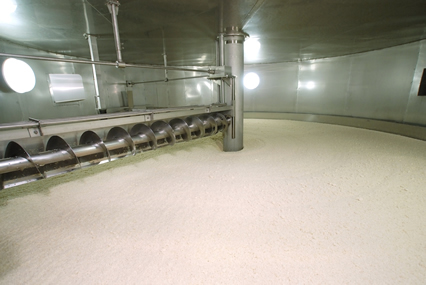 At two factories, over 6000 kilograms of rice are processed. As expected of such a large producer. We will continue to make mass-production-type, high quality, delicious sake. Compared to major sake makers, our company still has many points that can be improved upon. The taste we will refine based on the needs of our consumers, and yet we will strive to continuously make products with a consistent quality. Furthermore, we would like to stretch out within the set laws, to develop products that our customers will think are interesting. By using our nationwide outlets, we would like to bring Harima's name to our customers. Tanrei a taste with the sharp and rich aroma. Without the habit to fit in any cuisine, lightness Uri. Were carefully polished white rice, tasteful pure rice sake. It is preferred by all ages. Rice 70 percent. I enjoy the taste of the rice in the rich aroma. Cup wine, wine pack is also developed, able to feel free.